As trade unionists, we the undersigned, stand in solidarity with the four non-violent anti-fracking activists who have been convicted of 'causing a public nuisance', three of whom are now serving custodial sentences. We strongly condemn this judgement and the dangerous precedent it sets for the right to protest and take non-violent direct action against threats to the climate and the environment. These are by far the longest prison sentences imposed on activists defending the environment since those jailed for the Mass Trespass in 1932. It can only be seen as politically motivated in support of a government that has shown it is prepared to ride roughshod over the democratic rights of citizens to achieve an end for which it has no popular support. This is a clear example of the state acting in the interests of big business in the face of opposition to fracking by the community at Preston New Road, and across the UK more widely. It is important to recall the concerns raised by the UN Special Rapporteur on Freedom of Association and Assembly in his report in 2016 regarding the "collusion between law enforcement authorities and private companies" in relation to fracking protests. At the TUC Congress in 2018, the trade union movement called for a moratorium on fracking in England which has already been stopped in Scotland, Wales and Northern Ireland. Many of us believe it should be banned in full. There is no safe fracking. It is not safe for the environment, water supplies, citizens or workers, or in addressing climate change concerns. A motion passed at Trades Union Congress carries the risk of moving backwards from last year's progress on climate policy (2017 climate motion). The Campaign against Climate Change is deeply concerned about elements of the GMB motion on 'Just transition and energy workers' voice'. Climate change is first and foremost a social justice issue. It will have consequences for every one of us, and hits the poorest first and hardest. The TUC therefore has the responsibility to reflect the voices of all its members in forming energy and climate policies. Future jobs in solar, wind and energy efficiency are crucial to our economy and these sectors have been badly affected by government cuts. The TUC must be a voice for them too, and call for urgent investment in climate jobs, not locking us into white elephant infrastructure such as new gas power stations. Energy unions of course have an important perspective but the suggestion that their views should be 'paramount and central' in determining TUC policy risks undermining strong climate action. 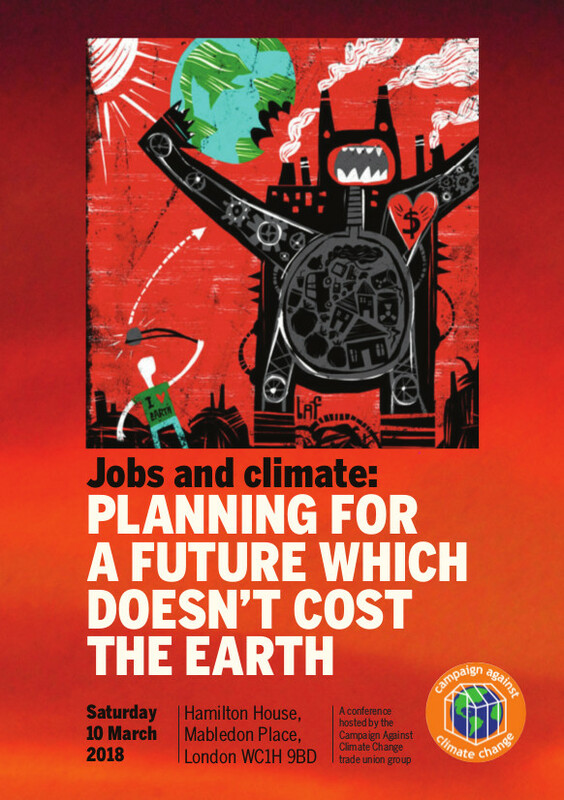 The conference "Jobs and Climate: Planning for a future which doesn't cost the earth" held on 10 March was a huge success. Over 200 people attended the event at the National Education Union Head Office. The conference set out to challenge the false choice of good jobs versus the environment. Instead of settling for this, there is both an urgent need for action on climate change and a real opportunity for trade unionists to be at the forefront of campaigning for a transition. One which puts the needs of the planet, decent jobs and social justice at the top of the political agenda. The theme of the opening session, introduced by Suzanne Jeffery, chair of the Campaign against Climate Change was ‘Jobs versus the environment: challenging a false choice’. Professor Joanna Haigh, a leading scientist at the Grantham Institute, outlined the urgency of action now to get to zero carbon by 2050. Sarah Woolley, whose union, the Bakers Food and Allied Workers Union, moved the climate change motion at the TUC, spoke about the need for unions to prioritise this issue. The BFAWU are calling on their health and safety reps to take this up and are producing a newsletter to support this role. Asad Rehman from War on Want, spoke about the importance of seeing this as more than just an environmental issue, and the need for a vision of the future that challenged a system that has caused the problem. Barry Gardiner, Labour Party Shadow Secretary for Trade and Climate Change, concluded. He emphasised that action should not be just a top down approach. Communities engaged in the fight against fracking illustrated this and he gave a pledge that one of his first priorities in any incoming Labour Government would be to introduce a ban on shale gas extraction.